This article is about the university established in 2018. For other universities, see Sorbonne (disambiguation). Sorbonne University (French: Sorbonne Université) is a public research university in Paris, France, established by the merger in 2018 of Paris-Sorbonne University, Pierre et Marie Curie University, and other smaller institutions. The date 1257 on its emblem refers to the historical University of Paris, whose Collège de Sorbonne was founded in 1257 by Robert de Sorbon, and had 13 inheritors, and these universities such as the Panthéon-Sorbonne University share many facilities. Paris-Sorbonne University (1971–2017), formerly a constituent part of the faculty of humanities of the University of Paris. Pierre et Marie Curie University (1971–2017), formerly a constituent part of the faculty of science and of the faculty of medicine of the University of Paris. As part of the reforms of French Higher Education, on 19 March 2018, the international jury called by the French Government for the "Initiative d’Excellence (IDEX)" confirmed the definite win of Sorbonne University. Consequently, Sorbonne University won an endowment of 900 Mio euros with no limit of time. This is the first higher education institution in Paris region to win such an endowment. The university was established by a decree of 21 April 2017 and took place on 1 January 2018. Sorbonne University has 3 faculties; additionally, Law is taught by Panthéon-Assas University. Letters are the more ancient teachings of the Sorbonne University. History, Geography, Languages, Musicology, Philosophy are part of this faculty. The Faculty of Science of Sorbonne University is a major research institution in France. It can be considered the successor in direct line to the Faculty of Science of the University of Paris. It has more than 125 laboratories, most of them in association with the Centre national de la recherche scientifique (CNRS). Some of its most notable institutes and laboratories include the Institut Henri Poincaré (Mathematics), Institut d'astrophysique de Paris (Astrophysics), LIP6 (Informatics / Computer Science), Institut des systèmes intelligents et de robotique (Robotics), Institut de mathématiques de Jussieu (foundations of Mathematics, shared with University Paris-Diderot) and the Laboratoire Kastler-Brossel (Quantum Physics, shared with École Normale Supérieure). The faculty of Medicine is located in the teaching hospitals Pitié-Salpêtrière and Saint-Antoine (the latter itself being the successor to Saint-Antoine-des-Champs Abbey). There is no Law school as such in Sorbonne University. 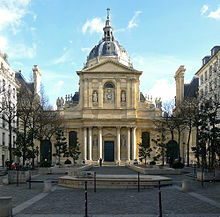 In 1971, most of the law professors from the Faculty of Law and Economics of the University of Paris decided to restructure it as a university, called Panthéon-Assas University (after the two main campuses of the Paris Law Faculty: place du Panthéon and rue d’Assas campuses).. Panthéon-Assas now provides Law teachings for Sorbonne University as an independent university. Sorbonne University's historical campus is in the historic central Sorbonne building, located at 47 rue des Écoles, in the Latin Quarter. The building is the undivided property of the 13 successor universities of the University of Paris, managed by the Chancellerie des Universités de Paris. Besides the monuments of the Cour d'honneur, the Sorbonne Chapel and the Grand amphitéâtre , the building houses the Academy of Paris Rectorat, the Chancellerie des Universités de Paris, part of the Universities Panthéon Sorbonne (Paris 1), New Sorbonne (Paris 3), Sorbonne University, Paris Descartes (Paris 5), the Ecole Nationale des Chartes and the Ecole Pratique de Hautes Etudes. Before the 19th century, the Sorbonne occupied several buildings. The chapel was built in 1622 by the then-Provisor of the University of Paris, Cardinal Richelieu, during the reign of Louis XIII. In 1881, politician Jules Ferry decided to convert the Sorbonne into one single building. Under the supervision of Pierre Greard, Chief Officer of the Education Authority of Paris, Henri-Paul Nénot constructed the current building from 1883 to 1901 that reflects a basic architectural uniformity. The integration of the chapel into the whole was also Nénot’s work with the construction of a cour d'honneur. The Sorbonne building is generally reserved for undergraduate students in their third year and graduate students in certain academic disciplines. Only students in Semitic studies, regardless of level, take all their classes at the Sorbonne campus. The Library of the Sorbonne is an inter-university library of the Universities Panthéon Sorbonne (Paris 1), New Sorbonne (Paris 3), Sorbonne University, Paris Descartes (Paris 5), and Paris Diderot (Paris 7), under the administration of Panthéon Sorbonne. It is open exclusively to undergraduate students in their third year and graduate students. With the former archives of the now-defunct University of Paris, 2,500,000 books, 400,000 of them ancient, 2,500 historical manuscripts, 18,000 doctoral dissertation papers, 17,750 past and current French and international periodicals and 7,100 historical printing plates, the Library of the Sorbonne is the largest university library in Paris and was entirely refurbished in 2013. The largest of Sorbonne University's campuses is Jussieu Campus, officially named “Pierre and Marie Curie campus”. It houses the Faculty of Science. The first buildings are from 1957. The main part of the campus, the “Gril d'Albert,” was built in 1964, and was completely refurbished from 1996 to 2016. The Maison de la Recherche campus is the central building for doctoral studies that hosts the history and geography departments. It houses the Serpente Library that has 55,000 works and 292 past and current French and international periodicals. All doctoral dissertations since 1 January 1986 have been stored at the Serpente Library. The two biggest campuses apart from the main Sorbonne building are the Clignancourt and Malesherbes centers. Undergraduate students in their first and second years of study in Philosophy, History, Geography, English and Spanish take their classes at the Clignancourt center. The Clignancourt Library contains 78,000 works, 210 French and international periodicals and 800 educational DVDs. Undergraduate students in their first and second years of study in French literature, French language, Latin, Ancient Greek and Musicology take their classes at the Malesherbes center. All undergraduate students in these academic disciplines study in the central Sorbonne building in their third year. Undergraduate and graduate students in German studies, Slavic studies, Italic studies and Romanian studies, regardless of level, take all of their classes at the Malesherbes center. The Malesherbes center also hosts three research centers in Italian culture, the cultures and literature of central Europe and the Balkans and the Germanic, Nordic and Dutch centers. The Malesherbes Library contains 200,000 works specializing in the study of foreign languages and cultures and 1,200 past and current French and international periodicals. More than 50,000 doctoral dissertations are available for public viewing. Undergraduate Art History and Archeology students take their classes at the Institut d'Art et d'Archéologie, located at the main entrance of the Jardin du Luxembourg. Constructed by architect Paul Bigot between 1925 and 1930, the Mesopotamian-style building was classified as a national historical building in 1996. It hosts the Michelet Library that contains 100,000 volumes of work on art history and archeology with 100 French and international periodicals. Only 10,000 of the art history and archeology works are open to students, the others requiring special authorization of usage. Graduate Art History and Archeology students take their courses at the Institut National de l'Histoire de l'Art in the Galerie Colbert, a partnered national institution of the University. Both the Institut d'Urbanisme et d'Aménagement and the Institut d'Etudes hispanique in the Latin Quarter host third year and graduate students of Geography and Iberian and Latin American studies. The Marcel Bataillon Library houses the Institut d'Etudes hispaniques' collection of 25,000 works on Iberian and Latin-American culture. Catalan studies take place at the Centre d'Etudes catalanes in the Marais. There are also Campus Pitié and Campus Saint-Antoine for medicine ; Campus Les Cordeliers, Campus Curie and Campus Raspail for sciences. An exclusive international agreement between Paris-Sorbonne and the government of Abu Dhabi was signed on 19 February 2006, starting plans to bring Paris-Sorbonne University to Abu Dhabi. The Paris-Sorbonne University Abu Dhabi (PSUAD) was established on 30 May 2008 on Reem Island by a decree of the ruler of Abu Dhabi of the United Arab Emirates. All programs are taught in the French language except for the Bachelor of Physics which is taught in English and the Masters programs. An intensive French language programme is offered for one or two year(s) to students who do not meet the French language requirement for registration. The establishment of the university demonstrates the keenness of Abu Dhabi to create an international hub in culture and education, having also signed a contract with the Louvre in 2007 to create the Louvre Abu Dhabi, and with New York University in 2007 to create New York University Abu Dhabi. PSUAD is jointly governed by the Abu Dhabi Education Council (ADEC) and by PSUAD's board of six members, three of whom are appointed by the home Paris-Sorbonne University, the other three appointed by the Abu Dhabi Executive Council. The President of PSUAD and Chairman of the Board is the President of the home Paris-Sorbonne University, currently Georges Molinié. Academic programs are offered at the undergraduate level only in the social sciences, humanities and fine arts. Members have worked on several projects in order to strengthen the relations between them and potentially create a new international institution. The most famous projects are the "Sorbonne College" (Collège de la Sorbonne) for bachelor's degree teaching and the "Sorbonne Doctoral College" (Collège doctoral de la Sorbonne) for PhD candidates. As it is the case in the Anglo-American university system, Sorbonne University proposes a major-minor system, that is currently being deployed at the University. Sorbonne University, in partnership with INSEAD, also offers all of its alumni and PhD students a professionalizing course in business management to complete their curriculum. Since 2010, every PhD student is being delivered an honorary diploma labeled Sorbonne University. This diploma highlights and gathers the skills of the doctors and researchers from the institutions that form Sorbonne University. The Sorbonne Doctoral College, created in 2013, coordinates the activities of the 26 doctoral schools. Since 2014, it has developed cross-disciplinary PhDs between the different members of the Sorbonne University Association. Since 2011, Sorbonne University celebrate its graduates in a formal ceremony where every PhD graduate wears a scholar uniform. Sorbonne University has formed with academic institutions such as the China Scholarship Council or the Brazilian foundation FAPERJ several partnerships enabling bilateral research programs. Sorbonne University is a member of LERU - League of European Research Universities - which gathers 23 european universities such as Cambridge and Oxford. The Sorbonne University houses eight notable scientific collections that are open to researchers. Some collections are open to the public as noted. Musée Dupuytren – moved from Cordeliers, will be open to the public occasionally, features wax anatomical items and preserved specimens illustrating diseases and malformations. Sorbonne University is consistently ranked in the top universities in Europe and the world. The first recognition of its existence as an integrated university came in 2018, when it appeared on the CWUR World University Rankings 2018-2019 in 29th place globally and 1st place in France. In the Academic Ranking of World Universities 2018, Sorbonne University is ranked in range 36 globally and 1st in France. In the Times Higher Education World Reputation Rankings 2018, Sorbonne University is ranked in range 51-60 globally and 2nd in France. The 2019 QS World University Rankings ranked Sorbonne University 75th overall in the world and 3rd in France. Individual faculties at Sorbonne University also featured in the rankings. Before the merger of Paris-Sorbonne University and Pierre and Marie Curie University, both had their own rankings in the world. Its founding predecessor Paris-Sorbonne University was ranked 222 in the world by the QS World University Rankings 2015. By faculty, it was ranked 9 in modern languages, 36 in arts and humanities (1st in France), and 127 in social sciences and management (5th in France). By academic reputation, it was ranked 80 (2nd in France), according to the QS World University Rankings, and 2nd in overall highest international reputation of all academic institutions in France, according to the Times Higher Education 2015. In 2014 Paris-Sorbonne ranked 227 in the world, according to the QS World University Rankings, 115 for Social Sciences and Management, 33 for Arts and Humanities. Pierre and Marie Curie University was often ranked as the best university in France. In 2014 UPMC was ranked 35th in the world, 6th in Europe and 1st in France by the Academic Ranking of World Universities. It was ranked 4th in the world in the field of mathematics by the same study. The 2013 QS World University Rankings ranked the university 112th overall in the world and 3rd in France. In 2013, according to University Ranking by Academic Performance (URAP), Université Pierre et Marie Curie is ranked first university in France, and 44th in the world. UPMC is a member of Sorbonne University Association. ^ "Association Sorbonne-Universités". Association Sorbonne-Universités. Retrieved 2018-01-01. ^ "Décret n° 2017-596 du 21 avril 2017 portant création de l'université Sorbonne-Université". Journal officiel de la République française. 23 April 2017. ^ "Monuments historiques: Sorbonne (La)" (in French). Merimee Database, French Ministry of Culture. May 23, 2018. ^ https://www.leru.org/ Ligue Européenne des Universités de Recherche (LERU). ^ "Patrimoine scientifique" (in French). UPMC. Retrieved 5 July 2016. ^ "CWUR World University Rankings 2018-2019". ^ "Academic Ranking of World Universities 2018". ^ "THE World University Rankings 2018". ^ "QS World University Rankings 2019". Top Universities. Retrieved 2018-06-07. ^ "QS World University Rankings Arts & Humanities 2013 Results". Yopuniversities.com. Retrieved 2016-11-13. ^ "Cinq universités françaises parmi les plus réputées au monde". Capital.fr. 2015-03-11. Retrieved 2016-11-13. ^ a b "Université Paris-Sorbonne (Paris IV) Rankings". Top Universities. Retrieved 2016-11-13. ^ "World University Rankings – 2013 – France Universities in Top 500 universities – Academic Ranking of World Universities – 2013 – Shanghai Ranking – 2013". Retrieved 15 July 2015. ^ "QS World University Rankings 2013". Top Universities. Retrieved 15 July 2015. ^ Institutions – UniversityRankings.ch – Results of University Rankings Archived 15 January 2016 at the Wayback Machine. UniversityRankings.ch. Retrieved 16 June 2014. Official website (English version) of the university. Official website of the Sorbonne University Association. Decree officially creating the university. This page was last edited on 20 April 2019, at 14:24 (UTC).